I’m taking another short break from my ongoing progression through the common basic rigs used for lighting an actor to look at a few effects rigs that can be used for seasonal pictures. Tonights rig, the Godspot, can be used to evoke the presence of God, that a deity is observing the scene, that, to light an angel or to indicate a character’s angelic qualities. 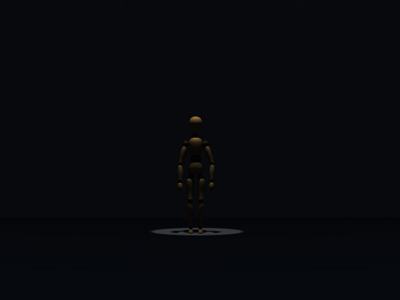 It can also be used to foreshadows a deus ex machina ending or in recent productions to simulate an alien abduction. 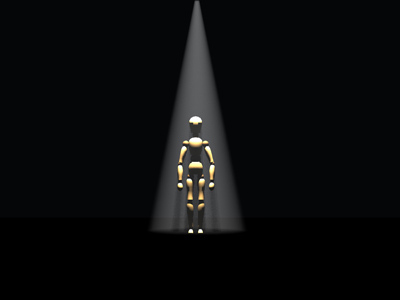 With a single spot no more than ten degrees from the vertical to the front of the actor it is very similar to rig #1 (Vue Lighting Rig #1: Single Spot Overhead) or (Vue Lighting Rig #4: Single Spot In Front). 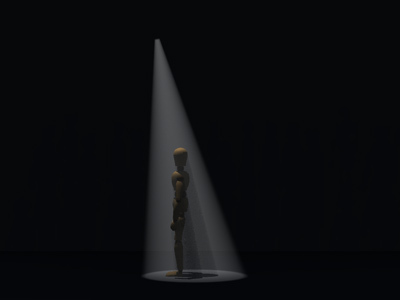 Usually a single powerful spotlight is used to light a single actor or a small, huddled group although lighting several characters scattered across a stage in this way separately at the same time can be very effective too. A light with a hard edge and as narrow a focus as possible is desirable to increase the effect. Ideally the light should be as high as possible so that the beam’s vertical edges are as close to being parallel as possible. A very bright, white light is usually used and artificial smoke may be required to give the beam clear definition. 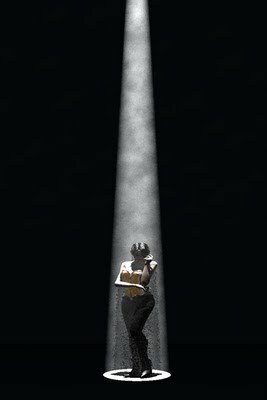 To achieve this effect in Vue a single spot light with a high power setting should be placed at least four or five times the height of the figure to be lit above the figure. The light should have volumetric lighting turned on. For the demonstration picture below I used a power setting of 1500 and a volumetric brightness of 0.5 .